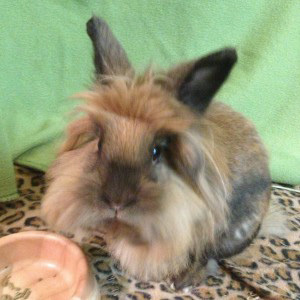 Tanzy is a Lion Head Rabbit that was a rescue from the Minnesota Companion Rabbit Society when she was around two years old. Her full name is “Tanzania” after the lion refuge in the Serengeti in Africa. Her friendly and outgoing personality make her a fantastic therapy rabbit! Patti and Tanzy visit as a North Star Therapy Animals team at Children’s Hospitals and Clinics of Minnesota in Minneapolis and various nursing homes in the metro area. The team also reads with children in several schools and libraries and works with at risk teens. In her free time, Tanzy loves attending Hoppy Hour at the Animal Humane Society and will expertly work the crowd of people in order to get petted by hopping from one person to the next.